Home » Blog » The dog days of summer – and a bit about trees. The Bamff drive in early September. It was lovely today. It happened in that way that Scotland has, of throwing up beautiful days at random, sprinkled between the cold, the windy and the wet ones. A gleaming day, at times a hot day, with just a glimpse of autumn – a tree here or there tinged with paprika or ginger. I walked down the drive in the morning to look at the beaver pools in the little hidden den just below the causeway that the drive runs along. This is an area I was hardly aware of before we had beavers. But now there are so many dams there – maybe six or seven, and a flight of deep pools which today were glassy still and reflecting the tall trees. It has become a magic glade. This landscape plan was drawn up “for the improvement of Bamff” in 1790 by Thomas White, a pupil of Capability Brown. Hundreds of beech trees were planted – not all of them in the places White had suggested – and now, nearly 250 years later, they are tall and venerable, with stout trunks and spreading branches. There is a line of them halfway up the hill and there are groups and individuals in the middle of fields and on the edges of woods. The beech trees’ seedlings probably came from England at that time – so although it is thought that beech might not have made its own way to Scotland without human aid there is much debate as to whether it should be defined as native or not. They are certainly very beautiful trees although they do cast a deep shade which prevents most flowers from growing under them. The next phase, in the nineteenth century, was one of exotic conifers from the New World – exciting new kinds of tree discovered in the magnificent primeval forests of North America as they were being opened up for logging. And we have some of these fine trees: Douglas Fir, Wellingtonia, Grand fir, and some huge Sitka spruce, often so tall now that you can identify parts of Bamff from a distance where these giants point up into the sky well above the others in areas of mixed woodland. A more regrettable 19th century habit was the planting of rhododendrons – often the invasive Rhododendron ponticum, or else more exotic varieties grafted on to ponticum rootstock which have now reverted. These plants are poisonous to eat and are not enjoyed by our native invertebrates or other species. Nothing grows under them either as they cast a deep shade all year round. They grow amazingly well and are hard to get rid of. Even once cut they sprout again vigorously. I spent a little time today with family members breaking off the shiny green leaves that were sprouting from stumps. 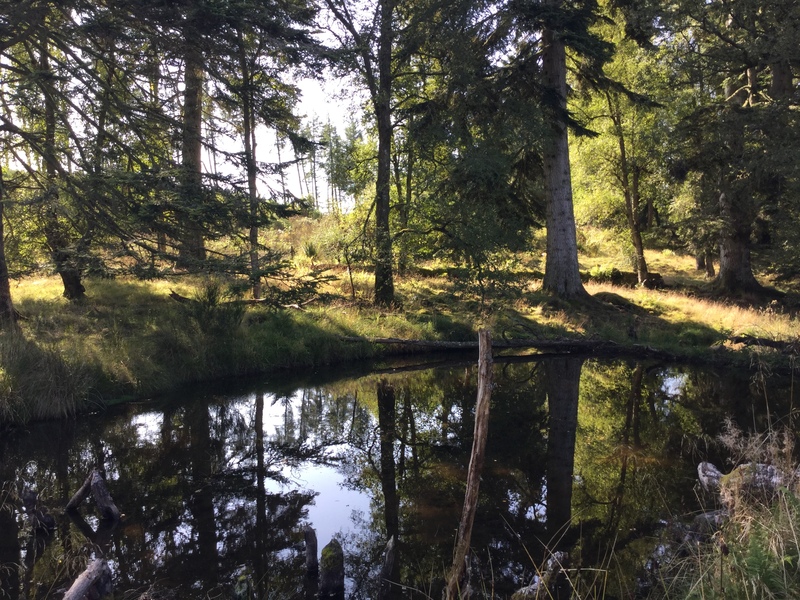 Luckily for us Dundee Conservation Volunteers have done an amazing job of eliminating them along the Burnieshead path (past the best known set of beaver pools – the ones on the Cateran Trail). And New Caledonian Woodland Volunteers are doing great work with the ones on the drive. Why did our ancestors inflict this problem on us? Well, for 2 reasons – firstly for decoration. They liked the big colourful blooms better than anything our native trees and bushes could produce – and secondly as cover for pheasants for shooting. But tastes change and now, for us, anyway, restoration ecology is the aim and the rhodies are no longer wanted or really considered beautiful in our context. From the early part of the 20th century forestry became a more commercial business and Norway Spruce, Larch and then Sitka Spruce became the favoured trees, planted not so much for beauty but for timber and thus money. They were planted in lines, and sometimes in square blocks. We tend not to like these plantations very much but they do bring in a bit of money when they are felled, so we are grateful to antecedants for this. The Norway Spruce woods, once thinned, become delightful red squirrel habitat, flowers returning as shafts of sunlight find their way to the forest floor. Again, the species is almost native. Norway is such a near neighbour and its just chance that the North Sea prevented its arrival here after the ice age. So, our native squirrel, also native to mainland Europe, loves to eat its cones. Behind the Bamff Hideaway, there are lots of red squirrel dining tables on tree stumps in the Norway Spruce wood. The Hideaway sits between a beaver pool and a Norway Spruce wood full of red squirrels. In recent years, our approach has been to think about ecology and nativeness in our planting schemes and regeneration projects. This is to enhance the beauty and the biodiversity of the woodland as well as its flood preventing, and carbon absorbing capacities. We hope also to find some modest commercial use for some of the trees that are thinned out, or blow down in gales. (Others are left to rot down and provide habitat for thousands of species). 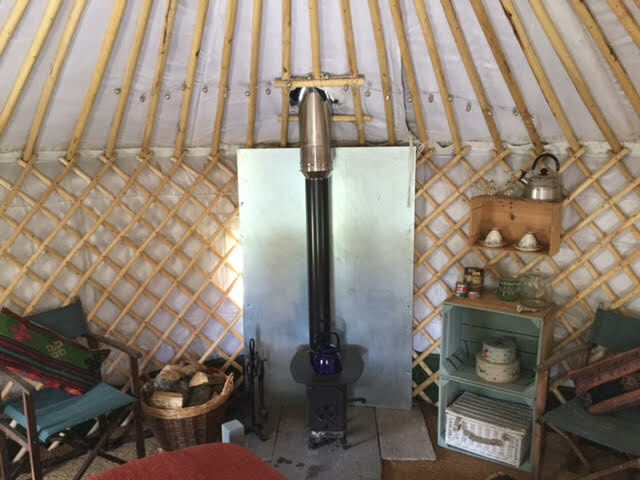 Our wood chip boiler which heats the big house and flats is supplied in this way, and most of the logs we provide to the cottages, yurts and hideaway also come from Bamff trees.